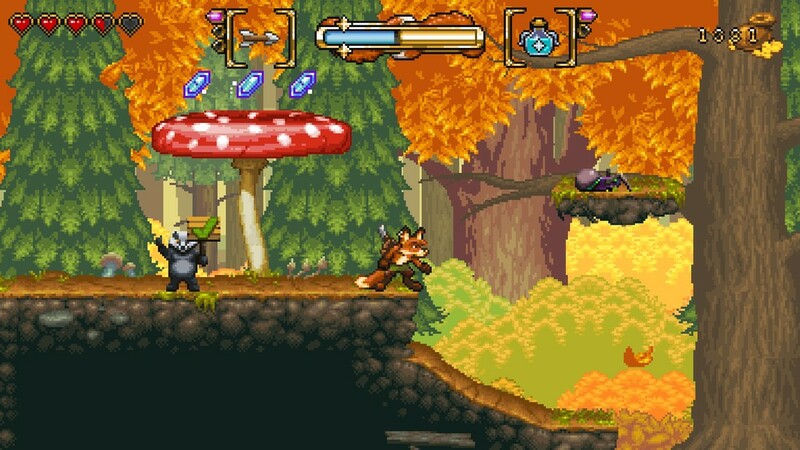 FOX n FORESTS is a 16-bit, action platformer that puts players in the shoes of Rick the Fox, a mischievous animal that ends up questing to save the seasons with his unlikely friend, Patty the Partridge. During Rick’s journey, he will utilize a crossbow, magic potions, and control the seasons to help reach his goal. The gameplay of FOX n FORESTS can best be described as a Contra RPG but with furries with a little bit of Cuphead thrown in. The gameplay is not nearly as fast and demanding, however, but it manages to still capture the niche that both Cuphead and Contra fill. While traversing each level, which are sectioned off into four different parts of a forest, there will be multiple types of enemies that will try to stop you from reaching your goal. These enemies can be dispatched with a magic crossbow, different skills, and powerful potions. As you play, you will collect gold (along with other collectibles) by defeating enemies, and that can be used to unlock more skills and upgrades to use. While the item and skill progression is linear, it is handled in such a way so those skills and power ups are only accessible once you have enough gold and/or materials. Because of this, you can get early access to upgrades as a reward for exploration. 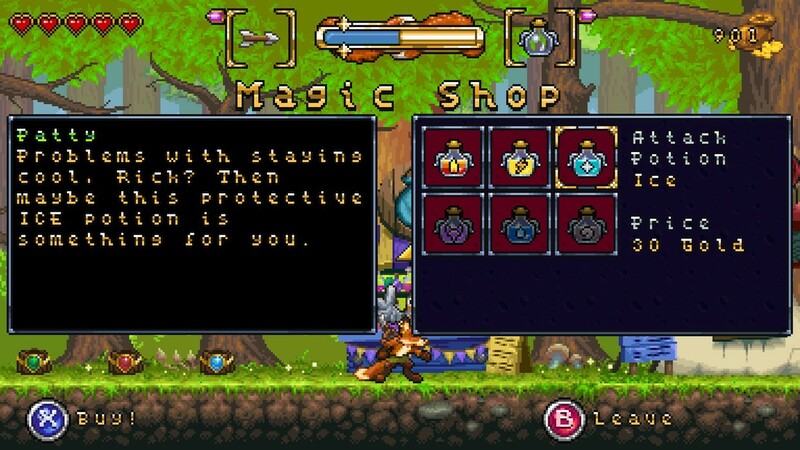 There are also standard character upgrades, which increase both your health and mana, and there are potions, which are single-use (but also replenishable) items that can perform six different actions, which can range from protection to massive area damage. You also get the power to switch between two different types of seasons in each level. Each season change is mandatory in order to complete each level, but there are some cases where using it not required, but it can result in having something cool or useful happen. One of the first major problems with FOX n FORESTS is the fact that the combat can be stale or frustrating at times. Because you have to remain stationary in order to fire your crossbow, it is often better to use melee attacks, with one of the most useful upgrades becoming available right after the first level. Since it is your main way of ranged combat, the pacing of the game can literally come to a stop in order to take someone out from afar. In addition, some ground enemies and arial enemies are difficult to dispatch with ranged attacks. The aerial combat, on the other hand, is actually quite nice, as you are able to use awesome melee attack to take out enemies, both aerial and grounded. It keeps the pace going, feels awesome when you are able to take out enemies skillfully, and is more convenient overall. It is quite a contrast in comparison to ranged, ground combat. 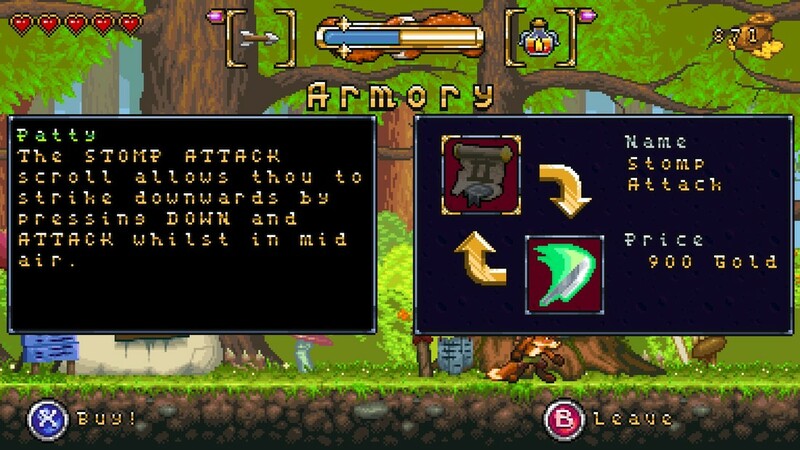 You do get arrow upgrades for each section of the forest you complete, and one does help with some of the enemies. However, because it uses mana, a resource that is necessary to switch seasons in order to overcome mandatory obstacles, it is ill advised to use while season are changed, which is often. There are also some levels that choose to stray away from the regular combat. For instance, there is a level where Rick rides on Patty, and you shoot oncoming enemies and avoid obstacles in an auto-scrolling level much like classic space shooters. It was an interesting choice, but it functions well. The only problem is that you die after one hit, but there are free checkpoints scattered throughout to help with this. The levels throughout FOX n FORESTS are well designed with lots of extra areas to explore as you get upgrades to your arsenal, and there are a few hidden secrets for those who like to explore. The reward for finding secrets are usually worth it in the form of items used to upgrade your magic crossbow, increasing your mana bar, or even getting access to bonus levels. As you complete each section of the forest, you will collect magic bark that will help restore the Season Tree to full strength to save the forest. In order to access the next part of the forest, you must have a certain number of seeds in order to grow saplings. These saplings are hidden throughout each level, and even though you most likely won’t have all the seeds needed initially, the extra upgrades you get at the end of each forest section will guarantee seeds that you missed from past levels. This was a great way to give extra mileage to each of the levels. Most of the levels themselves function well, and the changing of seasons really adds to the flavor of each level. There is a health bar, and there are consequences for death. Throughout each level, there is a badger that you can pay to activate a checkpoint. Whenever you die, you go back to the last checkpoint bought, and any items gained, enemies defeated, and items used are completely reset. While not required to buy a checkpoint, it is recommended as dying at the end of a level without activating a checkpoint means that all progress is lost and reset. It is a nice way to be forgiving to new players as well as still having a punishment for death, preventing the game from being too easy. The enemy designs are interesting and fun to look at, and there were only a couple instances where something looked or felt stale. 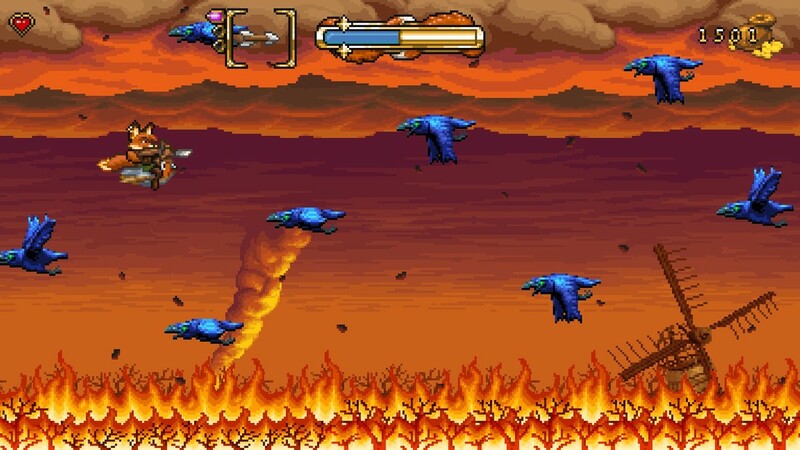 The sound design for some of the enemies, however, really stood out because of the odd change in quality for the sounds. However, the animations for all of the characters, from movement to attacks, felt solid and fluid. ​The music is one of the highest points in this game. The soundtrack is absolutely gorgeous, and there are so many memorable tracks throughout the time I played. To make things even sweeter, the soundtrack changes when seasons are switched, and the music feels like it reflects whatever season you are on. When you change the season from Spring to Winter, the soundtrack goes from an upbeat tune to a light melody, and when you change from Summer to Autumn, the soundtrack goes from an energetic piece to a lazy, free flowing song. These little touches really make the soundtrack stand out from everything else and help set the mood with the seasons. The boss music, on the other hand, is not so great. It is grating, way too plain, and honestly just disappointing. Despite this, the entire rest of the soundtrack is amazing, and it is only this track that is an outlier. While on the topic of bosses, the designs for the boss fights are not that great. When first fighting bosses, especially the first one, you are thrown right into the fight. While this would not be a huge issue if bosses took most of the damage needed with regular attacks, but there are special ways to defeat each boss. You will most likely die the first time around because it is not clear what you should be doing. Once you die, the game offers to help you out, and it will tell you what you have to do. This is a very poor way of handling the boss fights because it tries to assume that the player will know how to do something specific. Not only does it end up being an artificial challenge, it also takes out any sort of enjoyment from the boss fights. As a result, what are supposed to be exciting challenges at the end of levels turns out to be a forgettable experience. The story for FOX n FORESTS is nothing special, and it is quite predictable. While the title is primarily focused on delivering an adventurous, fun, and lighthearted game, the story tries to be a prominent point in driving the game forward. The main problem is how forced the beginning feels. While the concept for why the forests have been taken over is interesting, the sudden and awkward introduction to the story feels a bit forced. Also, there are also a few awkward sentences in the dialogue. The characters are also pretty two-dimensional with predictable character development. Rick and Patty go back and forth for comedic effect, and while this is all done in spite at first, it ends up becoming endearing, for Rick ends up caring more than he originally did about the adventure. These characters never really evolve past that, and because there was effort put into making a story, there could have definitely been something more meaningful here. However, there are still a few funny bits of dialogue sprinkled throughout the game. 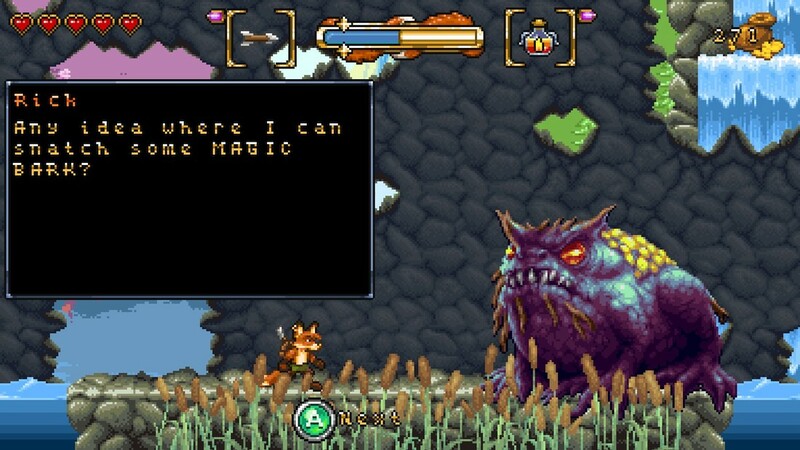 FOX n FORESTS is reminiscent of action-platformers of games current and past. It offers neat levels and enemies, although some are hit and miss, as well as fun melee combat, but ranged combat is slows the game down. The music is fantastic, and the game rewards players for exploration. While the story and boss battles are majorly lacking, the game is carried on how vibrant and fun each level is to explore even after the first completion.